In the last post , we showed you the steps on how to re-download your purchases in Windows Store easily with My Library feature. As you use Windows Store more and more, there’s a chance you will accidentally hit the Buy button and your credit card will be charged instantly. If you have kids, this could happen from time to time. 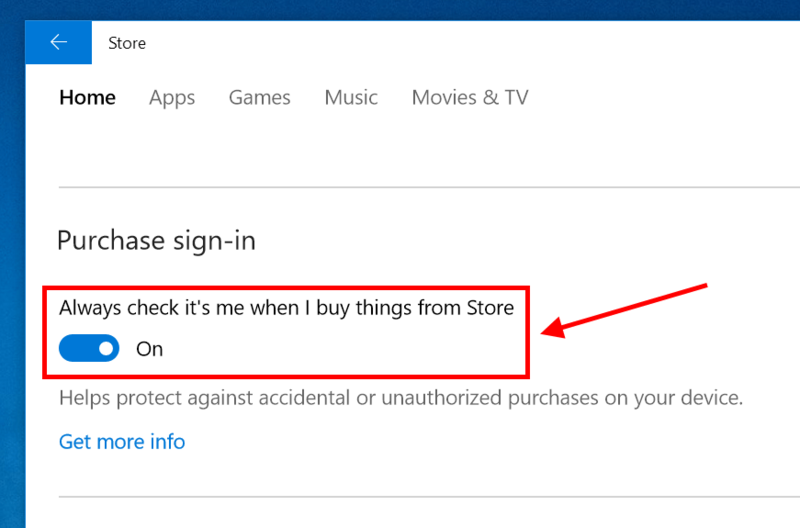 So to protect you from this, Windows Store has a small setting called “Purchase Sign-in” that requires you to enter the account password whenever you make a purchase. Before we start, you should know this feature is brand new and is included in the latest update of Windows Store. That means you need to check for an update of the Store app if you don’t see it. To update the Store itself, you can tap your account button in the Store app and choose “Downloads and Updates.” After that, hit Check for update button. When you’re all set, the Purchase Sign-in setting is lied within, well, the Settings section. Click your account button then select “Settings” to open settings page. Here you’ll see the Purchase Sign-in toggle, switch it to on to make it ask for the password everytime or switch it off if you feel it’s just annoying.